Concrete specialists at a Shropshire firm have joined forces with a renowned agricultural supplier to help farmers create the very best environment for their animals. TG Concrete – which is part of the Tudor Griffiths Group in Ellesmere – had developed three products aimed specifically at the agricultural sector and the TG AgriCrete range is already proving hugely successful. Now the team has formed a partnership with the Wynnstay Group who will now supply the specialist TG YardCrete, TG StoreCrete and TGSilageCrete in their network of stores. Tudor Griffiths, Managing Director of the TG Group, welcomed the partnership and said the deal was a great fit for both companies. 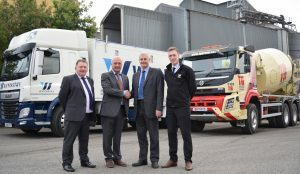 “We pride ourselves on the quality of our products and the high levels of customer service we deliver, so to join forces with such a well-respected company as the Wynnstay Group is great news. TG Concrete developed the range after farmers said they were looking for hard-wearing and highly durable solutions for their yards and buildings, and all three of the ready-mixed concrete products comply with the very latest agricultural standards, having been designed to help resist abrasion, erosion, and chemical damage. Ken Greetham, Chief Executive of the Wynnstay Group, said they had been very impressed by the quality of the AgriCrete range which had been created to meet some particular agricultural requirements. Wynnstay Group manufactures and supplies agricultural products to farmers and the wider rural community in Wales, the Welsh border counties, the Midlands, Lancashire, Yorkshire and the south west. The TG AgriCrete range will be available in all the Wynnstay stores across Shropshire, Cheshire, and north and mid Wales.